Ships from and sold by NBB Media. Fabulous! 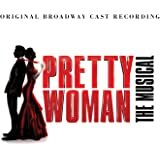 Lots of energy and overall a great rendering of a good old fashioned musical. Yes, "Ladies Man" was included, event though it has no part in original "Good News" having been written for the movie. Still have to give this baby 5 stars! Fun music and my child loves this CD to use for her 'shows' at home. One of the songs, Life is Just a Bowl of Cherries, was even used in one of her talent shows...it really is full of great songs. Exactly what I wanted and delivered within a few days. 5.0 out of 5 starsGood News for Good News! 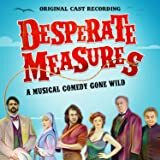 Terrific recording and what fun with all those great songs..Saw a production recently at the Goodspeed theater in East Haddam Ct. and what a great production it was in this wow- of- a -theater!..Enjoy every song and full orchestra and wonderful cast in this CD. 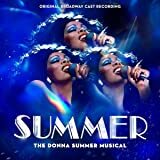 The original broadway production was never recorded and the broadway revival recording is rare and can set you back big bucks. 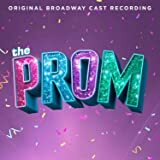 So this regional production is the only recording available. And it isn't bad! 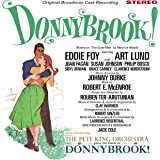 Its got good singers and a nice, full orchestra. What it doesn't have is any historical relevance. 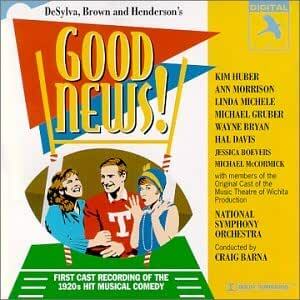 "Good News" was a simple 20's musical with a typical book and a better than average score. 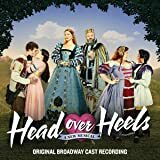 This production has decided that the score could be improved upon and threw in songs from the Henderson library as well as songs added in the 40"s movie. The result is alot of familiar songs and no real feeling for the original show. Still, its alot of fun listening to these old chestnuts. I just want people to know that if they don't have this CD they are missing the boat. I have just finished performing this play and I think it one of the best plays I have been in or seen.